The oversized panel, I hope, achieves the sense of pause after the climax and resolution of Lucky’s arc. 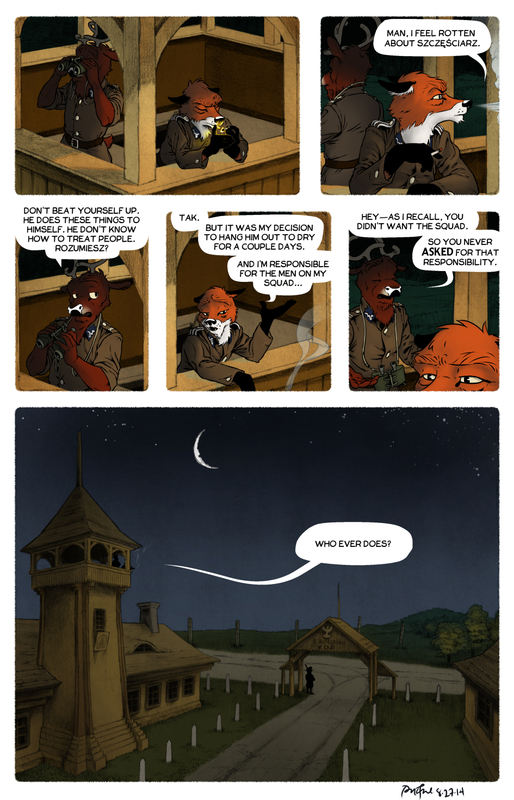 There are still many unanswered questions at this point in the story, but Lucky has unambiguously stepped out of the picture for now, and Rudek now needs to think about what kind of person he is, and how he defines responsibility. Plus, 50 was a nice round number. So let’s close Chapter 1 of Rudek and the Bear here, and look forward to further developments in Chapter 2! These last pages was great. A powerful ending to the story arcs. Great mood. Pretty impressive, really. I think in this episode, you nailed the feeling, both in your dialog and your art, that the weight of command has on Rudek. That said, I spent enough hours in my previous career, standing duty in various guard towers, that I can vouch for the level of the discussions that occur in them. Rudek and Szpadel both show a lot more depth than, say, Kapitan Bzik might ever be capable. Given the circumstances, I got kind of a Franco-Belgian comic book feel out of the page count, the way those albums are usually published (though I think they usually go up to 52). Not a bad start for the first chapter, having just noticed these earlier pages, I wasn’t sure what direction you might be taking this to, seemed pretty jokey for the first 20 or so until something started to develop.